You can feel it in the air (and at the shopping malls, too) – Christmas is coming! Days full of love and peace. Days we would like to spend with our family at home. Perhaps, there is nothing that would keep you from your lovely home. Well, maybe there is! My colleague Lenka Fabianová did some research and found several astonishing decorations that would make your Christmas… let’s say… non-standard. Let’s breathe the Christmas atmosphere from hotels! The 13-metre (40-feet) faux evergreen, located in the gold leaf-bedecked rotunda of the hotel. This was the tree built in Emirates Palace Hotel in Abu Dhabi in 2015. It was decorated with silver and gold bows, ball-shaped ornaments and small white lights. The necklaces, earrings and other jewellery draped around the tree’s branches are what give it a record value. It held a total of 181 diamonds, pearls, emeralds, sapphires and other precious stones. The price of the tree itself was about 10,000 dollars and the jewellery had a value of over 11 million dollars. Really rich Christmas. At Fairmont San Francisco Hotel there is a gingerbread structure so large you can go inside of it! 22 feet tall, the house included 7,750 pieces of house made of gingerbread bricks, 1,500 pounds of royal icing, 700 pounds of sweets. Dedication: The team spent around 375 hours making the house and 520 hours engineering the framework construction. Remarkable! Techies had a love affair with NYC Yotel – Yobot. This luggage-storing robot operates year-round, allowing guests to store their bags in bins before check-in and after check-out, and retrieve them when needed with the scan of a custom barcode. But around the holidays, Yobot turns into #YOBOTSanta, doling out gifts like free flights, hotel stays, and travel essentials to lucky guests who select prize-holding bins for storage. Welcome back to Dubai. There is a hotel – Atlantis The Palm – where even Santa makes an appearance in the festivities, and can be seen in the hotel’s aquarium in scuba diving equipment! He would probably prefer snow, however, as there is cold at the North Pole, warm water can help him, too. It is well known that Santa Claus lives in Finland and Rovaniemi is the official home town of Santa Claus. 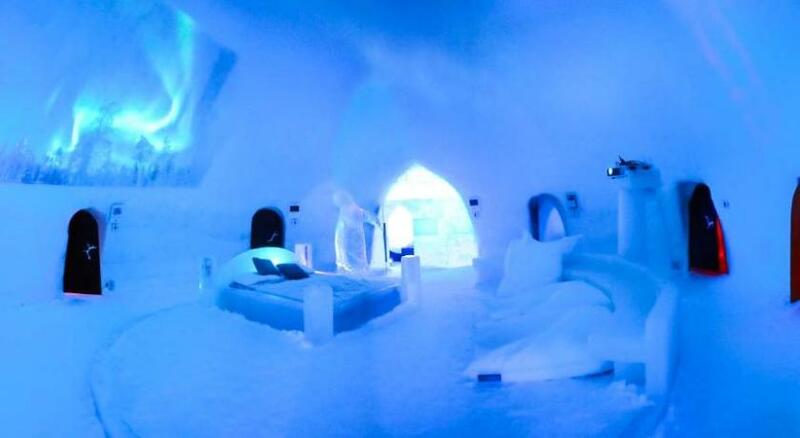 Snowman World Igloo Hotel is a place where Santa finds his peace when he is currently after the hassle with Mrs. Claus. Look at these pictures and book it for a weekend. 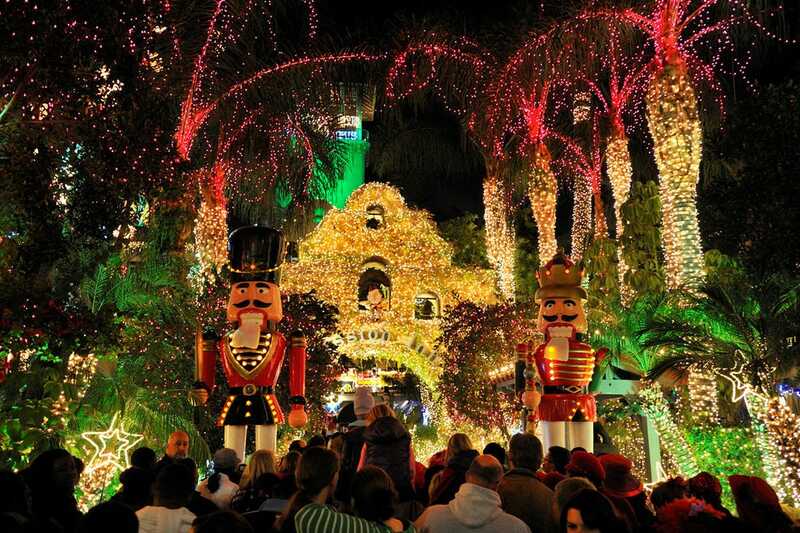 The Mission Inn Hotel & Spa – Southern California´s historic hotel which kicked off the holiday season on November 25, 2016 with Festival of Lights – a free, six-week-long holiday extravanganza featuring one the nation’s largest holiday collections of its kind. You can find there more than 400 animated figures including angles or elves, the world’s largest man-made mistletoe and even Santa Claus will appear! You can also see Christmas trees of all kinds in the lobby and throughout the hotel. And if you are a fan of cakes, delectable holiday confections at the famous Casey’s Cupcakes are among other festive offerings. You should definitely come! You see that there are many hotels that are creative when it comes to Christmas. Which one would you like to see on your own? Let us know in comments. Also, please let us wish you a merry Christmas and we hope you will find everything you wished under your tree!